Do you remember the Alchemists? They were scientist who tried for decades to turn metal into gold. Today, we know that is impossible, but what is possible, is to turn nutrition into medicine. Disease is on everybody’s mind nowadays, and if we want to change that, we should think about preventing it. 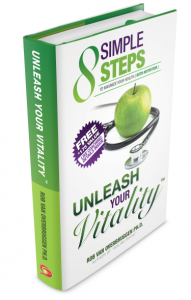 Unleash Your Vitality – 8 simple steps to maximize your health with nutrition is a step by step guide, which will show you what to do to prevent becoming ill, while being able to live a long, revitalized, and happy life. Take action now, and maximize your health !